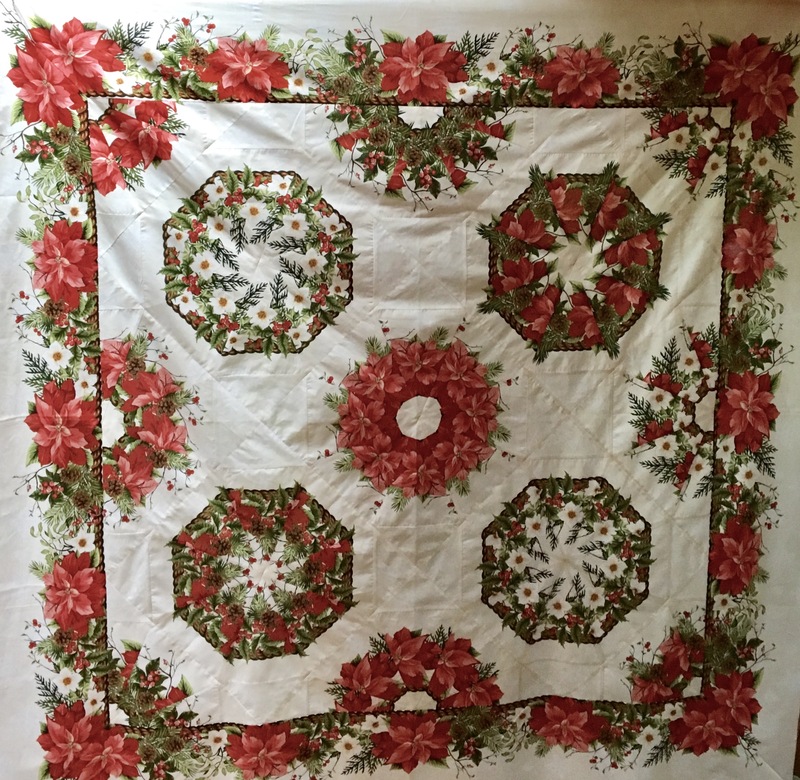 ￼This is a tutorial for Jason Yenter’s Winter Twist One-Fabric Kaleidoscope Quilt Pattern. The pattern is available from and uses fabric from In the Beginning. Cut 6 Repeats of the Fabric. Each repeat is about 24″ long. 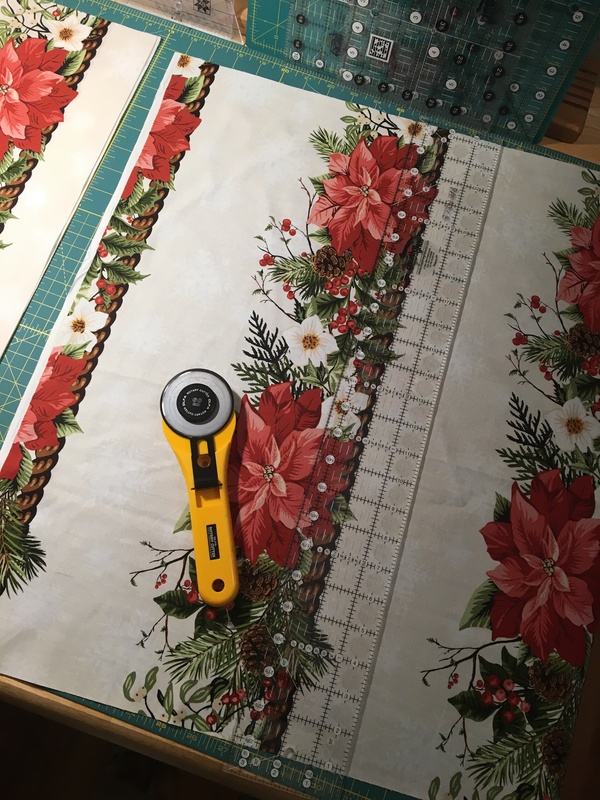 Cut each repeat of the fabric into 4 border strip pieces. Cut 2″ from the edge of each brown cable. You will have 24 border pieces that are approximately 24″ x 9 1/2″. Group these into 3 sets, each with 8 layers of fabric. 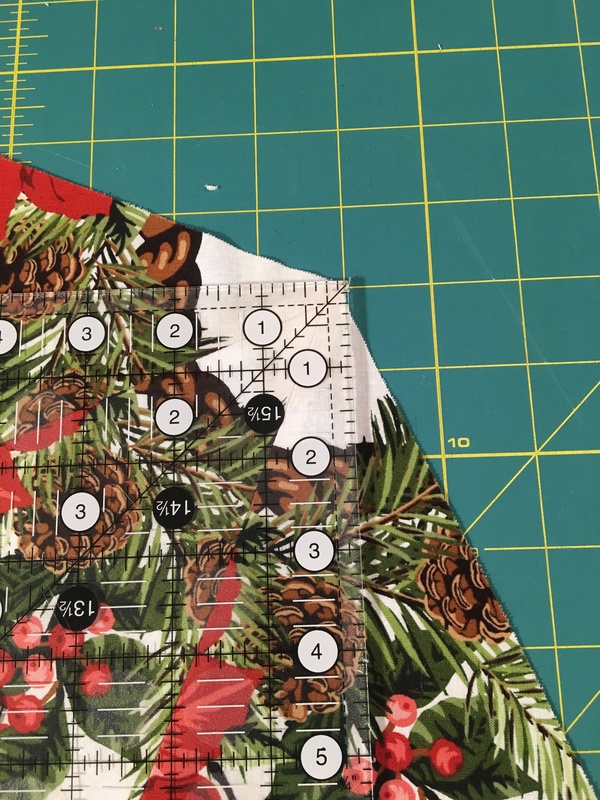 Line up the layers in each set by putting a straight pin straight through the same place in the fabric design on each layer. Run a second pin through all layers next to the first pin to hold the layers in place. Repeat this process 3 or four more times along the length of the strip. Trim the strip sets to 8 1/2″ wide. This is easiest to do with an 8 1/2″ wide ruler. From each strip set cut at least 3 sets of triangles using a 45 degree triangle ruler with a 8 1/2″ cutting line on the ruler. Make sure the ruler has flat top at the triangle point. Make sure to cut 4 sets that have the cable at the base of the triangles and 5 that have the cable at the point. Cut selectively to get different areas of and colors from the fabric design. You should be able to get at least 4 sets of triangles from each set so you will have enough fabric for at least 12 blocks. This will let you pick and choose which ones you want to use and allows for errors in cutting, as well. Take 4 of the sets of the triangles with the cable at the point of the triangle and separate them into sets of 5 for the side blocks and sets of 3 for the corners. Refer to the pattern diagrams for piecing the blocks. 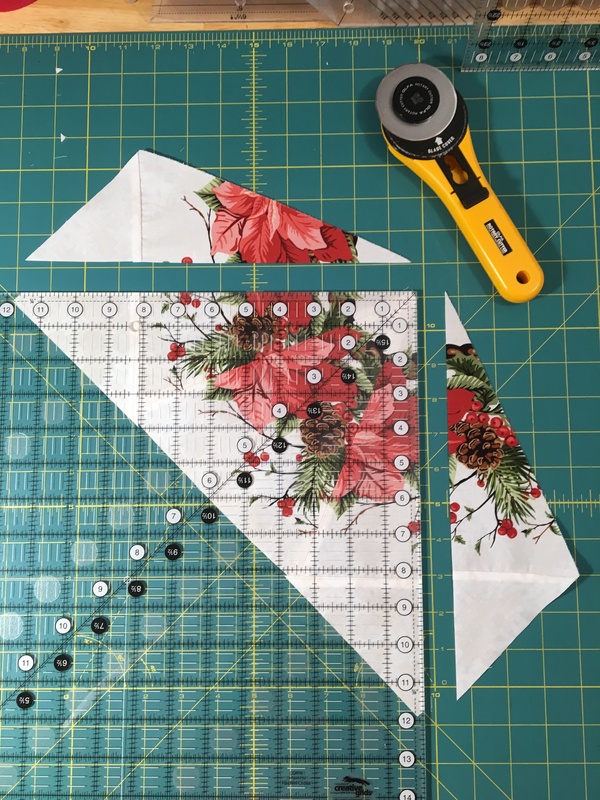 For each of the 5 center blocks sew four pairs of triangle pieces together. Then sew two sets together, and then the two halves together. I prefer to press all my seams open for these blocks. You will have four blocks with the cable on the bottom, and one with the cable at the point. This one is the center block. For the Side Blocks sew two pairs together. Then sew the two halves together. To finish sew a fifth triangle to one side of the block. 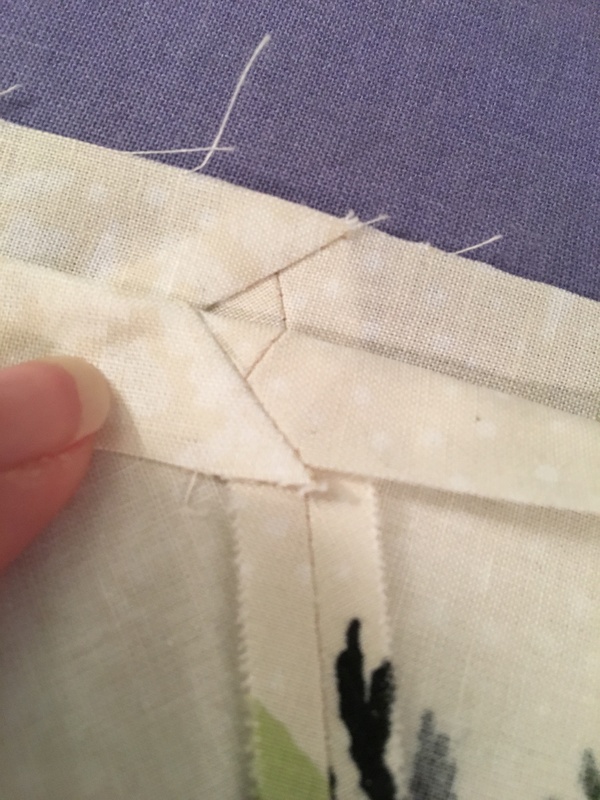 I press seams open except for the last triangle. That seam is pressed towards that 5th triangle. For each of the corner blocks sew a pair of triangles together and then sew the third triangle to one side of the block. Press the seams open. To make it easier to piece the corners I cut oversized pieces and then trim the block afterwards. Cut three 6″ strips. Then cut 20 6″ squares from these strips. Cut each square in half on the diagonal. You will have 40 triangles for the block corners. Refer to the pattern diagrams for piecing these corner triangle pieces. After sewing these corner triangles you will need to trim the blocks. 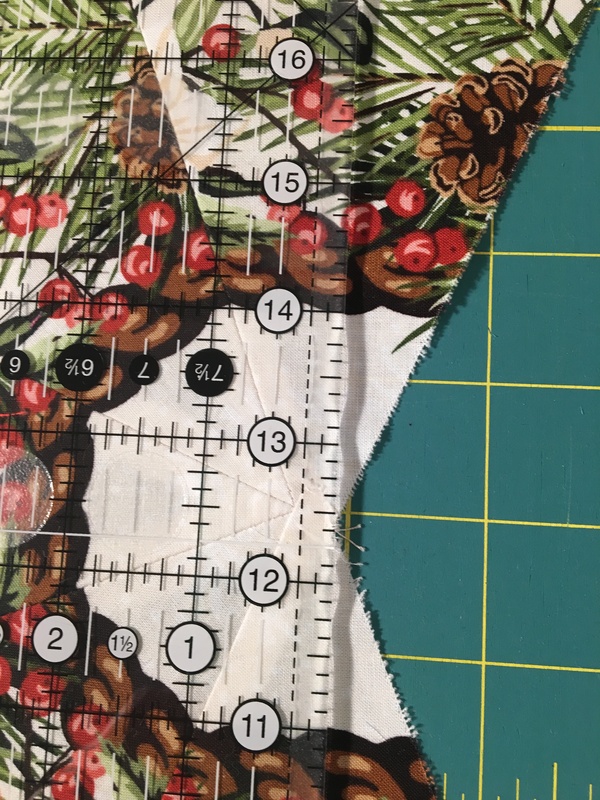 Leave a 1/4″ seam when trimming. A 16 1/2″ square ruler makes this much easier to do. You can trim the side and corner blocks before you sew them into the quilt top. Be careful! Make sure to leave a 1/4″ seam. I used a 24″ long ruler to make this cut. For the side pieces: Place the block with outside triangles to your right. 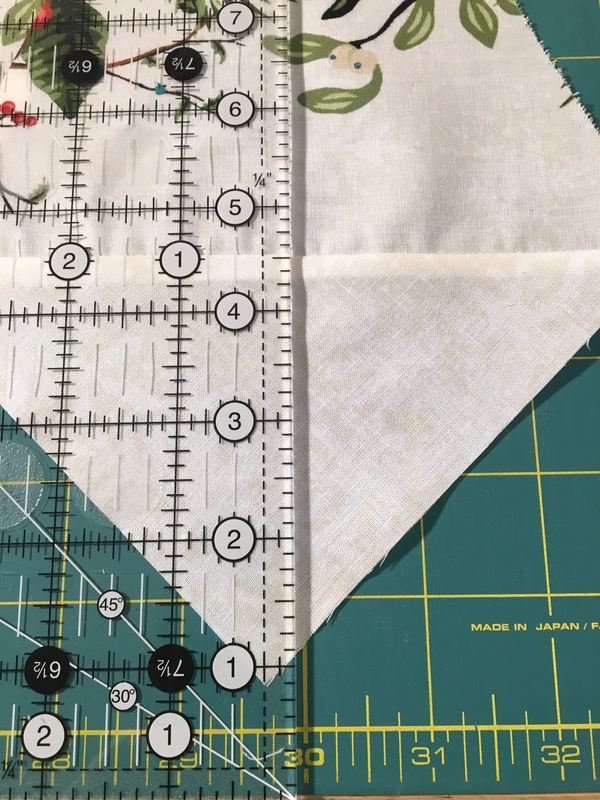 Line the bottom edge of the block up on the 45 degree line on your cutting board or on your ruler and cut 1/4″ past the center and through the triangles on the ouside. Pictures work best …. 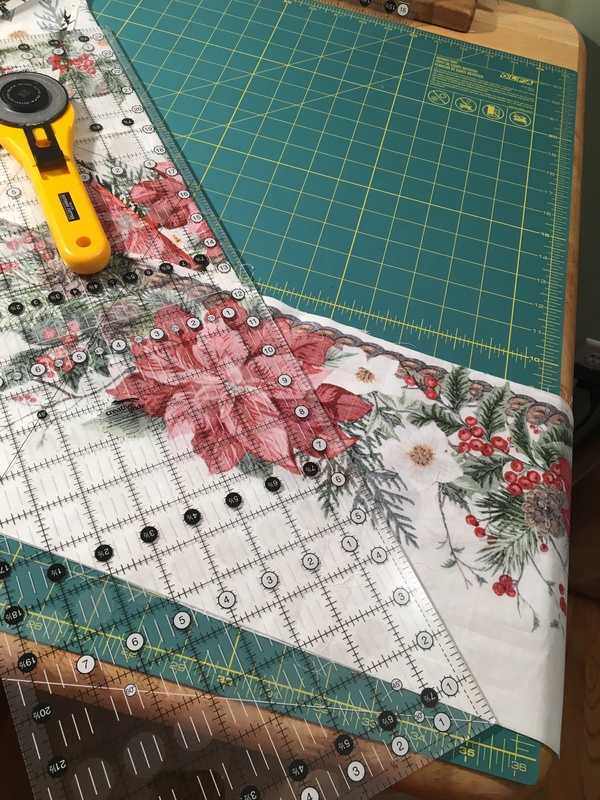 Corner Blocks: line the longest straight edge up on the 45 degree line on your cutting mat. Line your 16 1/2″ Square ruler up so that it is 1/4″ away from the center of the outside triangles and cut. Once all the blocks are prepared arrange them and sew them in diagonal rows as explained in the pattern. 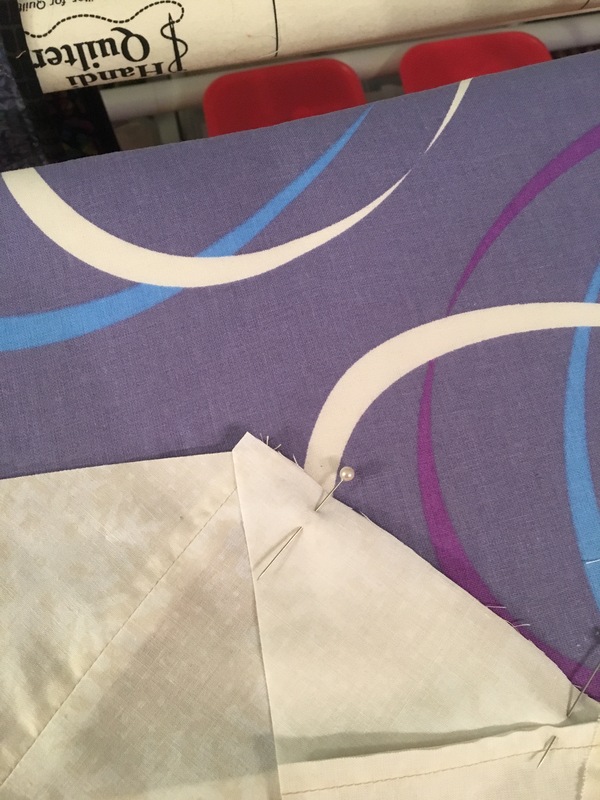 When matching the seams as you sew the blocks together you can fold back the seam to see if you are lining things up correctly. Pin in place when you have the seams matched up. If you cut the corner blocks before piecing the rows please be careful to piece the ends so that you leave a seam allowance for the border. 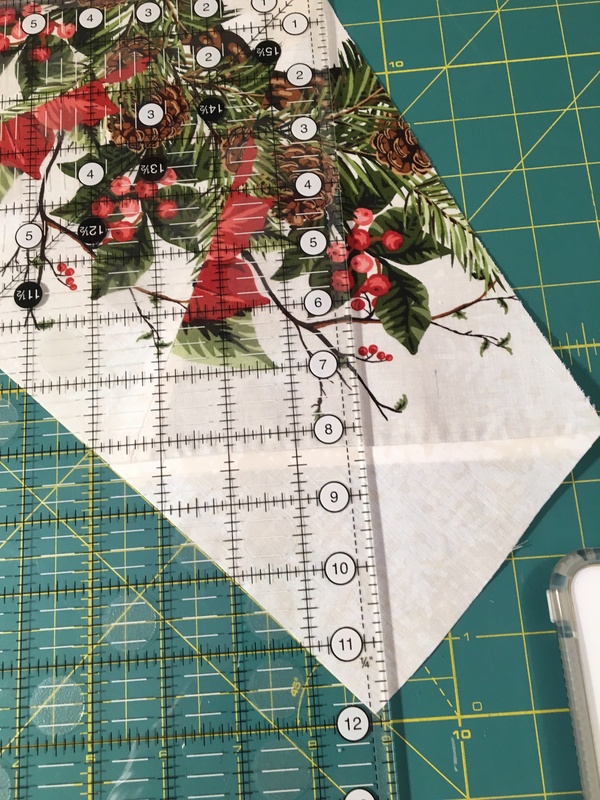 Borders: cut the remaining yardage into four 8 1/2″ wide border pieces that are each the length of the remaining fabric. Start by cutting 1/4″ away from the cable design for each of the four pieces. Then trim each to 8 1/2″ wide. The best way to manage the fabric is to roll it up and unroll as you cut along the length of the fabric. Be careful! 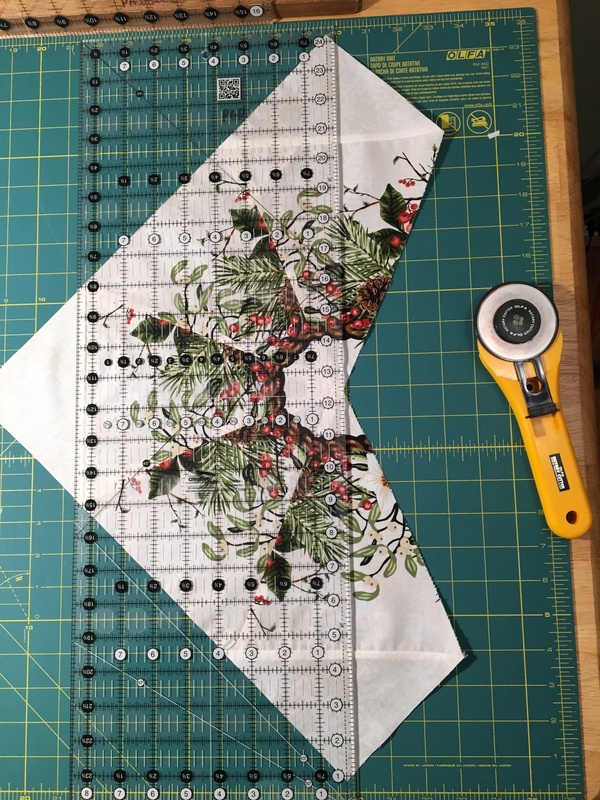 Follow the pattern instructions for sewing on the borders. 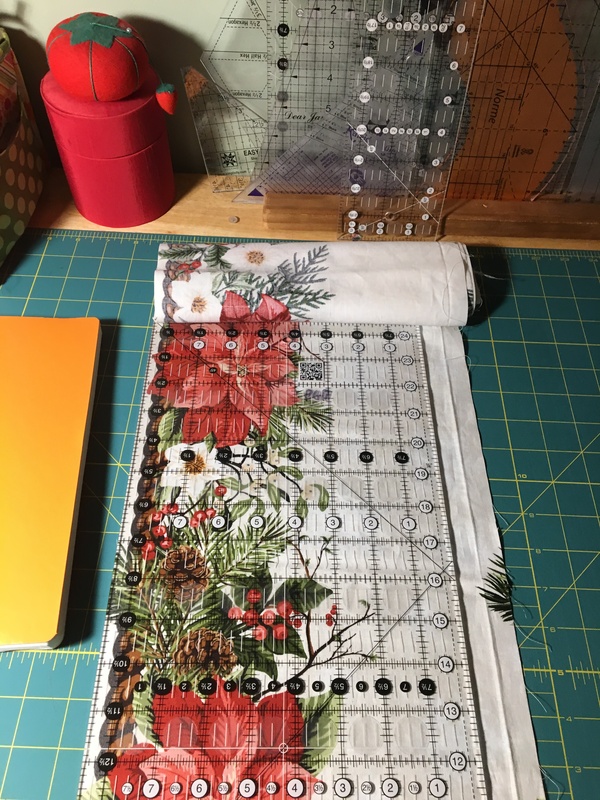 I pressed the border seams away from the border, but you will have to press the corners towards the border when cutting the mitered corners, then press them back towards the blocks after sewing the corners together. Here is a photo showing how to trim the ends of the borders. Please note that becuase of the larger size of these blocks they are not going to be very flat. The triangles are on the bias and stretched no matter how much best press I used! My sewing machine cooperated and I was able to ease the fullness into the seams when piecing, but you can see puckering at the seams. Let’s see how this looks after the top is quilted! 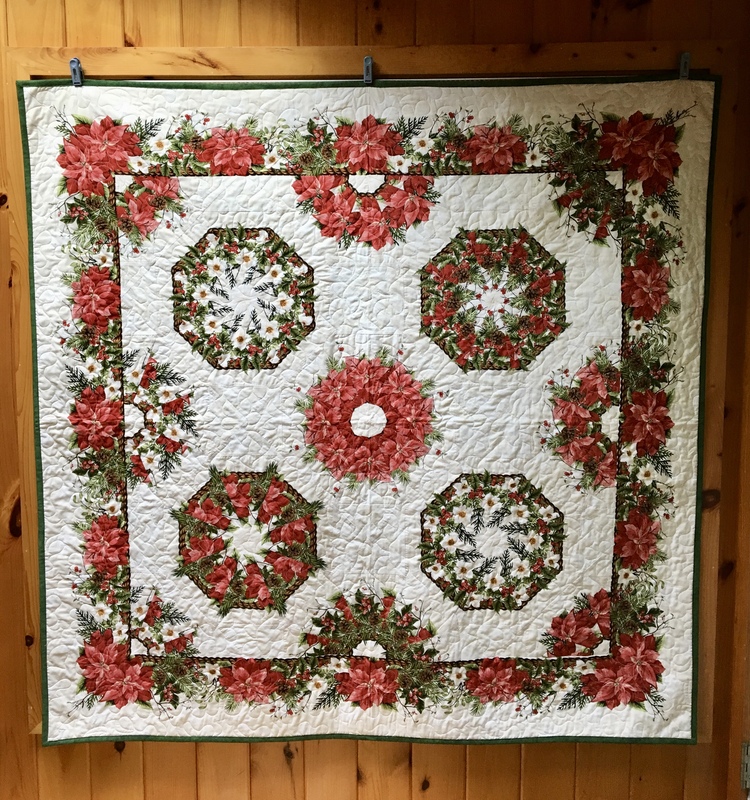 This entry was posted in Class, Holiday Quilts, Patterns and tagged Christmas quilt, in the beginning, Jadon Yenter, Kaleidoscope Quilt, winter twist on October 3, 2017 by pmegio. Beautiful! Makes me want to start one now!